‘A World of Fragile Parts’, V&A Applied Arts Pavilion. Sale d’Armi, Arsenale. Venice Biennale 2016. 28 May – 27 November 2016. ‘Infractus’ was exhibited at the V&A’s Applied Arts Pavilion at the Sale d'Armi in the Arsenale, in an exhibition entitled "A World of Fragile Parts", curated by Brendan Cormier. The exhibition explored the threats facing the preservation of global heritage sites and how the production of copies can aid in the preservation of cultural artifacts, through engaging the long curatorial history of casts, copies, and replicas. Robin Hood Gardens, the housing estate designed by Peter and Allison Smithson in 1972, has been slated for demolition—while many protest that it should be preserved. Local MP Margaret Hodge suggested that providing a 3D scan of the building would be enough preservation to legitimize its demolition, raising the question of how much a digital version can really replace a building. 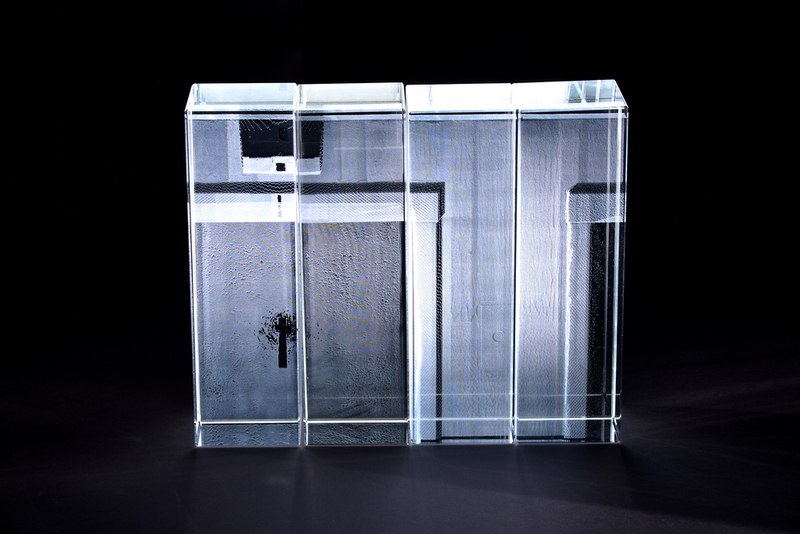 In Infractus, SmoutAllen with ScanLAB Projects, have scanned the building and associated remnants of domestic life, all in its current dereliction, and have manifested data through 3D crystal laser etching, a process normally used for the creation of mass-produced souvenirs. 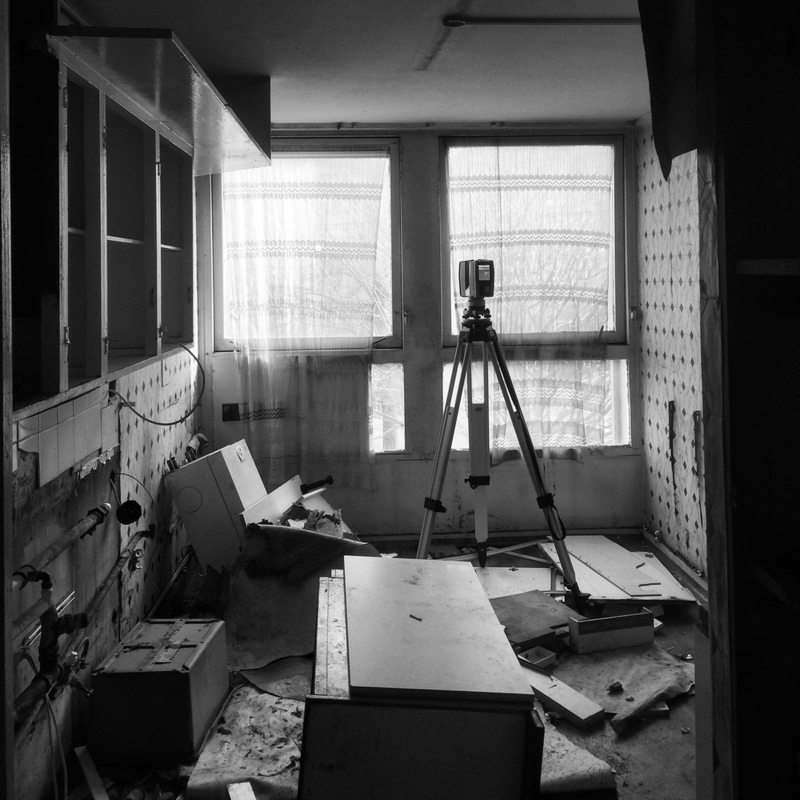 Essential fragments of Robin Hood Gardens are captured using terrestrial 3D laser scanning. Each fragment contains hundreds of thousands of individually measure points, captured by the scanner as part of a 360-degree sphere of survey information, however, not all surfaces are captured perfectly. The rough finished concrete of the Smithson's design reflects the laser perfectly, however, broken glass blocks and the gloss surface of lift shafts, in the work give slightly mistaken measurements and noisy data. These miss-measurements, normally excluded by rigorous surveying filters, are left embedded. Like 'makers marks' they are tell tale signs of a technology that, on the one hand, captures a meticulous and viable facsimile of the world whilst on the other, expresses the inherent imperfections of digital precision.